Need something more powerful than a plow to move snow? Woods’ snow blower attachments use the same auger and impeller combo as a two-stage snow blower, but they’re able to expand their scale by harnessing the power of your tractor. With 7 models to choose from, they have complete attachments designed for tractors with anywhere from 15 to 175 HP. A snow plow pushes snow directly to the left or right, clearing the way while creating a massive snow drift. While that may be fine if you’re clearing a path or a driveway, it can quickly become impractical to clear fields and parking lots, requiring repeated passes to collect the snow in one small area. 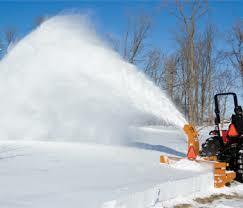 A snow blower picks up snow and pushes it through a chute, moving it far away from where it is being picked up. That means you won’t be moving the same snow over and over again, significantly reducing the time it takes to clear large areas. Woods’ two-stage design uses an auger to chop up snow and feed it to a large fan that pushes the snow through a chute. However, the similarity to stand-alone commercial snow blowers ends there. The gear case is built into the back of the auger housing and uses chains to connect to the auger and impeller. That means the auger runs the entire length of the housing instead of being split around the gear case, increasing snow moving capability, preventing clogs and reducing the chance of damage from front-end impacts. The sides of the auger housing are reinforced with steel plates to resist impacts and help cut through the snow. All single auger models are designed to be used with a Cat 1 driveline, and they’re compatible with ASABE quick hitches. Optimum PTO speed is 540 RPM. The chute has 270 degrees of rotation and can be paired with an optional electric or hydraulic rotator for quick adjustments. Compatible with tractors with 15-25 HP and a Cat 1 three point hitch. These attachments have two augers, one positioned on top of the other. This lets them pick up thick accumulation with a single pass. The chutes on these models rotate 200 degrees and are adjusted using a standard hydraulic chute rotator. These models are compatible with Cat 2 and 3 hitches and Cat 4 drivelines. They’re designed to operate at a PTO speed of 540 or 1,000 RPM. Whether you’re taking care of your lawn or you handle commercial contracts, Shank’s Lawn Equipment has everything you need to get the job done. We service and sell a wide range of outdoor equipment from walk-behind mowers to tractor attachments like these Woods snow blowers. Visit us at 4900 Molly Pitcher Highway in Chambersburg, PA. That’s one mile east of I-81 via Exit 10/Marion. Need parts for your Woods equipment? We can ship what you need to any address in the U.S. or Canada. To order, visit us online at www.shankslawn.com. This entry was posted in Uncategorized and tagged snowblower attachments, Woods Equipment Company, woods snowblower attachments. Bookmark the permalink.